Oak Ridge is a city ripe with history while being on the cutting edge of the future at the same time! Department of Energy facilities, the Oak Ridge National Laboratory, the Carbon Fiber Facility, and the future Uranium Processing Facility all make their home in Oak Ridge. 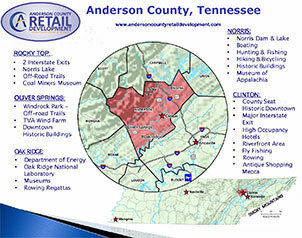 High traffic counts and a high daytime population are bringing many new businesses to the Oak Ridge area. For more information on available commercial properties, please contact the City of Oak Ridge or the Oak Ridge Chamber of Commerce (see links below).